"Allerleirauh" (English: "All-Kinds-of-Fur", sometimes translated as "Thousandfurs") is a fairy tale recorded by the Brothers Grimm. Since the second edition published in 1819, it has been recorded as Tale no. 65. Andrew Lang included it in The Green Fairy Book. Allerleirauh is discovered by the king. Illustration by Henry Justice Ford (1892). It is Aarne–Thompson folktale type 510B, unnatural love. Others of this type include "Cap O' Rushes", "Donkeyskin", "Catskin", "Little Cat Skin", "The King who Wished to Marry His Daughter", "The She-Bear", "Mossycoat", "Tattercoats", "The Princess That Wore A Rabbit-Skin Dress", "Katie Woodencloak", and "The Bear". Indeed, some English translators of "Allerleirauh" titled that story "Catskin" despite the differences between the German and English tales. A king promised his dying wife that he would not marry unless it was to a woman who was as beautiful as she was, and when he looked for a new wife, he realized that the only woman that could match her beauty was his own daughter. The daughter tried to make the wedding impossible by asking for three dresses, one as golden as the sun, one as silver as the moon, and one as dazzling as the stars, and a mantle made from the fur of every kind of bird and animal in the kingdom. When her father provided them, she took them, with a gold ring, a gold spindle, and a gold reel, and ran from the castle the night before the wedding. She ran far away to another kingdom, and slept in a great forest there, but the young king of that place and his dogs found her while he was hunting. She asked the king to have pity on her and received a place in the kitchen, where she worked, and because she gave no name she was called "All-Kinds-of-Fur." When the king held a ball, she snuck out and went to it in her golden dress. The next morning, the cook set her to make soup for the king, and she put her golden ring in it. The king found it and questioned the cook and then All-Kinds-of-Fur, but she revealed nothing. The next ball, she went dressed in her silver dress and put the golden spindle in the soup, and the king again could discover nothing. The third ball, she went in the star dress, and the king slipped a golden ring on her finger without her noticing it and ordered that the last dance go longer than usual. She was not able to get away in time to change; she was able only to throw her fur mantle over her clothing before she had to cook the soup. When the king questioned her, he caught her hand, seeing the ring, and when she tried to pull it away, her mantle slipped, revealing the dress of stars. The king pulled off the mantle, revealing her, and they married. Among variants of this tale, the threat of enforced marriage to her own father, as here, is the usual motive for the heroine's flight, as in "The She-Bear", "Donkeyskin", and "The King who Wished to Marry His Daughter", or the legend of Saint Dymphna, but others are possible. Catskin fled because her father, who wanted a son, was marrying her off to the first prospect. Cap O' Rushes was thrown out because her father interpreted her words to mean she did not love him. The Child who came from an Egg fled because her (apparent) father had been conquered by another army. "The Bear" flees because her father is too fond of her and keeps her prisoner to keep her safe. The motif of a father who tries to marry his own daughter is overwhelmingly found in fairy tales of this variety, ending with the three balls, but it also appears in variants of "The Girl Without Hands". The oldest known variant is the medieval Vitae Duorum Offarum; it appears in chivalric romance in Nicholas Trivet's Chronique Anglo-Normane, the source of both Chaucer's The Man of Law's Tale and John Gower's variant in Confessio Amantis, and in Emaré. It also became attached to Henry the Fowler. When the motive is the enforced marriage, many modern tales soften it, by representing the daughter as adopted (as in Andrew Lang's version of "Donkeyskin" for The Grey Fairy Book), the marriage as put forth and urged by the king's councillors rather than the king himself, or the entire notion being a fit of madness from which he recovers in time to attend the wedding. Alternately, the undesired marriage may be to an ogre or monster. Variants of "Cinderella", in which the heroine is persecuted by her stepmother, include "Katie Woodencloak", where the heroine is driven off by the persecutions and must, like Allerleirauh, seek service in a kitchen. The heroine does not always have to flee persecution; Tattercoats is denied permission to go to the ball because her grandfather had sworn never to look at her, but he has not driven her off. Robin McKinley adapted this in her novel Deerskin, in which the princess is raped by the king before she can escape. 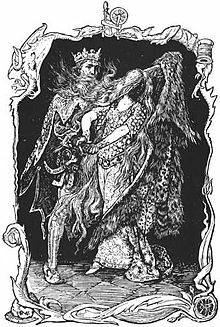 In Jane Yolen's version, also entitled "Allerleirauh", the king marries his daughter, who has been emotionally neglected by her father and misunderstands the king's intentions toward her. The daughter dies in childbirth like her mother. The end of the story suggests that the daughter's daughter will suffer the same fate when she comes of age. Allerleirauh was featured in Grimm's Fairy Tale Classics under the title, "The Coat of Many Colors". An episode of Jim Henson's television series The Storyteller is based on this tale, with several changes. Namely the Princess being the youngest and most beautiful of the King's three daughters, and nicknamed "Sapsorrow" by her cruel sisters. Rather than the king desiring to marry her, the marriage is enforced by the court as a law decrees the king must marry whomever's finger fits the late queen's ring, and since Sapsorrow put the ring on, she is forced to marry her father, against both her and her father's wishes. The video game The Wolf Among Us, based on the Fables comic, uses the daughter, named Faith here, and the prince, her husband Lawrence, from "Allerleirauh" as characters within the game and as major drivers for a modern-day New York City murder plot. The character represents a slightly variant form of this story, Donkeyskin. Allerleirauh is one of the Grimm fairy tales featured in the play The Secret in the Wings by Mary Zimmerman. The ending of this version is rather ambiguous, as the narrators of the story frequently contradict both one another and the actions of the characters onstage. Chantal Gadoury wrote a retelling of the fairy tale, titled under the same name "Allerleirauh", where at the end the Princess faces her father and the sexual abuse she endured by him. Folklorist and poet Margaret Yocom wrote a full-length book of erasure poetry, ''All Kinds of fur'', published by Deerbrook Editions in 2018. In Elizabeth Lim's 2019 novel Spin the Dawn, the protagonist Maia must sew three dresses, made from the laughter of the sun, the tears of the moon, and the blood of the stars, in order become the emperor's master tailor. ^ Heidi Anne Heiner, "Tales Similar to Donkeyskin"
^ a b "Helen Pilinovsky, "Donkeyskin, Deerskin, Allerleirauh"". Archived from the original on 2010-01-13. Retrieved 2011-01-23. ^ "KIN S FUR | Deerbrook Editions". www.deerbrookeditions.com. Retrieved 2018-05-15.